Heat 2 tablespoons oil in a 12″ cast iron or other heavy skillet over MEDIUM-HIGH heat. When nice and hot, add half the beef cubes and season them with 1/2 teaspoon seasoning salt and fresh ground black pepper, to taste. Allow to sit, undisturbed for a couple of minutes then stir and cook just long enough to sear the beef without cooking it through. 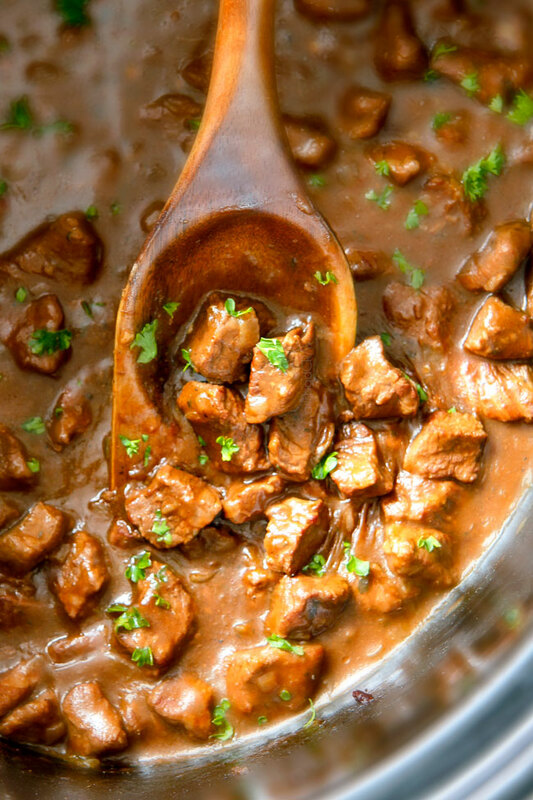 Use a slotted spoon to transfer beef to the slow cooker. Add remaining oil to pan and repeat with remaining beef cubes, seasoning salt and pepper. Add the beef broth and Worcestershire sauce to the slow cooker and sprinkle the beef with the Italian seasoning and thyme. Sprinkle the diced onions and garlic over the top.Tuck a bay leaf into the mixture. Cover and cook on LOW for 5 to 6 hours or on HIGH for 3 to 4 hours, or until beef is fork tender. Combine water and cornstarch in a small bowl and add to slow cooker. Stir until sauce has thickened and cook on LOW for an additional 10 minutes. Remove bay leaf and serve. Delicious serve over mashed potatoes, rice, or noodles.